Stone Legends believes in supporting the masonry industry which allows our products to be admired by the public. If you need more information please E-mail or call. Our highly experienced technicians are ready to help you. Waited too late? No Problem! Bring your truck today or take advantage of our local delivery. We deliver on time and we carry over 10,000 products to meet any need. 4 week turn around or Less! United Masonry Contractors Association We serve masonry contractors in the Dallas-Fort Worth area, providing fellowship, education, information and aid in setting standards for professionals in our industry. The "Golden Trowel Award" is awarded each year by the United Masonry Contractors Association. 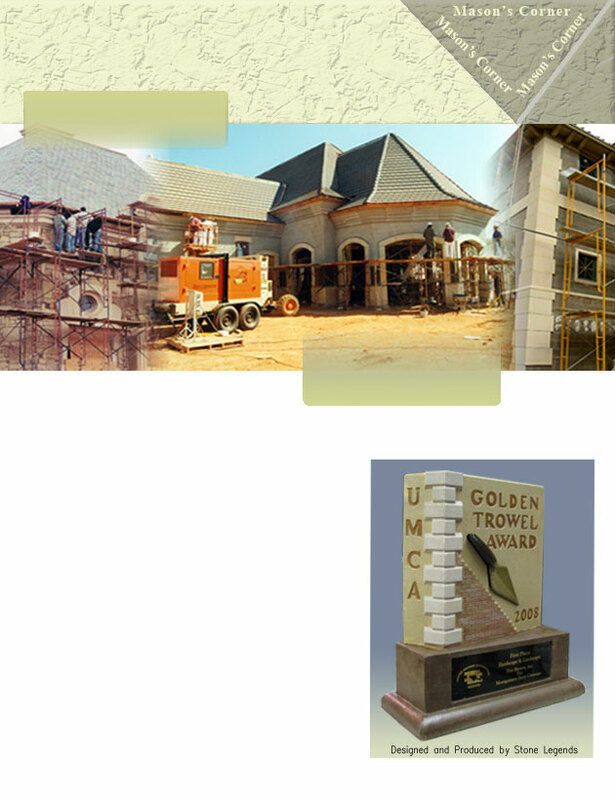 Stone Legends was chosen to design and produce the 2008 Golden Trowel Award for this year’s presentation by the UMCA. This is the first time in UMCA history, an associate member was chosen to provide these prestigious awards. The UMCA recognizes member individuals and companies through award programs. The winners of this award share their projects with us all in order to improve our standards excellence in the masonry field.